Apple and Facebook are cash flow kings. Cash-cow stocks like Apple and Facebook often make for winning investments. Image source: Getty Images. Investors can often find stock market winners by looking for companies that generate a lot of cash on a consistent basis. A strong free cash flow – which is the cash that a company generates from its operations that is left over after it makes necessary investments in its business – enables a company to pay dividends, buy back shares of its stock, and grow the business via acquisitions and in other ways. Having plenty of cash coming in is important for all companies, but especially ones involved in technology, where the ability to invest in innovation and fast growth is especially critical. There's no single factor that qualifies a company as a "cash cow," but such companies will generally have a high free cash margin, which is the percentage of revenue converted into cash, and/or a high cash return on invested capital, which reflects how good a company is at turning capital into cash and is calculated by dividing free cash flow by invested capital. Two companies that fit the bill are Apple (NASDAQ:AAPL) and Facebook (NASDAQ:FB). Apple's cash flow soared upon the introduction of the iPhone in 2007. Image source: Apple. Apple's name is practically synonymous with "cash cow," which is largely due to the immense popularity of the iPhone. Over the 12 months through its most recent fiscal fourth quarter, the tech superstar generated free cash flow of $52.28 billion on revenue of $215.65 billion, which equates to a cash margin of 24.2%. Apple's cash return on invested capital is likewise standout, clocking in at 25.8%. While this is still a very impressive number, it has come down over the last year. This probably reflects to some degree that it often simply gets more difficult to generate higher and higher returns on invested capital as a company's cash stash builds up. 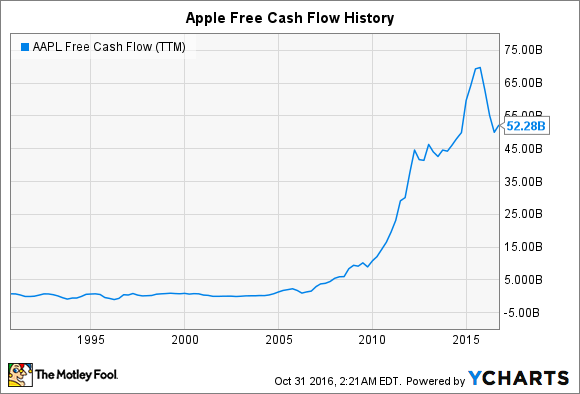 However, more meaningfully, it also no doubt reflects Apple's declining free cash flow due to declining sales of the iPhone. AAPL Free Cash Flow (TTM) data by YCharts. Over the last few quarters, Apple's year-over-year revenue has declined because quarterly year-over-year sales of the iPhone have declined, as the iconic smartphone accounts for about two-thirds of the company's top line. As is generally typical, a decline in revenue has hurt both the bottom line -- or net income -- as well as free cash flow. The iDevice maker is going to have to increase iPhone sales and/or introduce another killer product in order for FCF to start moving up once again. iPhone sales might soon get that boost due to September's launch of the iPhone 7, which was surrounded by a good amount of positive buzz, combined with rival Samsung halting production of its Galaxy Note 7 smartphone in early October due to several phones overheating and catching on fire. Facebook's headquarters. Image source: Facebook. 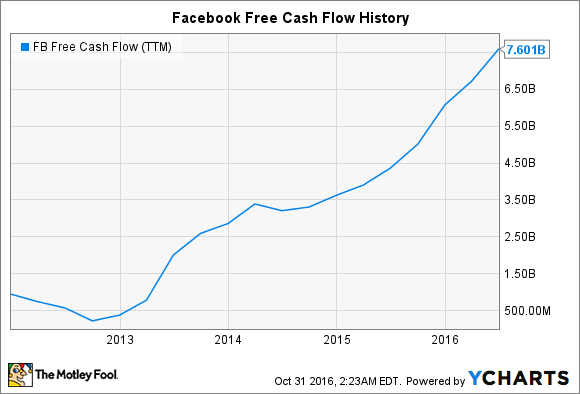 What's particularly impressive about Facebook is that it's generated a positive free cash flow ever since going public in 2012. Moreover, its free cash flow is at an all-time high, as the chart below shows. FB Free Cash Flow (TTM) data by YCharts. Over the trailing 12 months through the second quarter (the company reports Q3 earnings after the market closes on Nov. 2), the social-networking giant generated free cash flow of $7.66 billion on revenue of $22.16 billion, which equates to an amazingly fat cash margin of 34.3%. To put this number in context, Apple's cash margin, as a reminder, is 24.2%, while Google parent Alphabet's and IBM's cash margins are 24.4% and 18%, respectively. Facebook's cash return on invested capital for the same time period is 17.1% -- this is a very solid number, but it does fall short of Apple's 25.8%, so despite its current struggles with the iPhone, Cupertino remains better than Facebook at turning invested capital into cash. This is by no means a negative for Facebook, as the company's core cash-cow Facebook platform is still growing nicely, with monthly active users (MAUs) rising 15% year over year to 1.71 billion in the second quarter. Moreover, Facebook owns some potentially lucrative platforms and other IP that it's yet to monetize or is in the very early stages of monetizing, including WhatsApp, Messenger, Instagram, and its 2014 virtual and augmented reality acquisition, Oculus VR. Wall Street has heady expectations for Facebook's continued revenue and earnings growth, which should bode well for its free cash flow growth as well. Analysts expect year-over-year earnings per share to jump 72.4% this year and grow at an average annual rate of 35.1% over the next five years.